For the PlayStation Portable and PlayStation Network game, see Lemmings (2006). 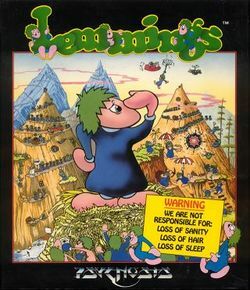 Lemmings was originally released on the Commodore Amiga and later ported to many different systems. New spin-offs and remakes continue to make appearances across the internet and on modern consoles. The Apple IIGS version was ported in 1996 by a team of programmers called "Brutal Deluxe Software" from the Atari ST version. This page was last edited on 26 February 2017, at 22:20.